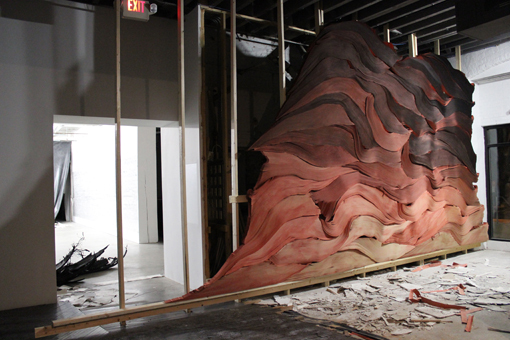 Jarrod Beck is a recent Bemis Center resident whose sprawling, architectural-scale installations emerge from a highly physical, elegant drawing process. 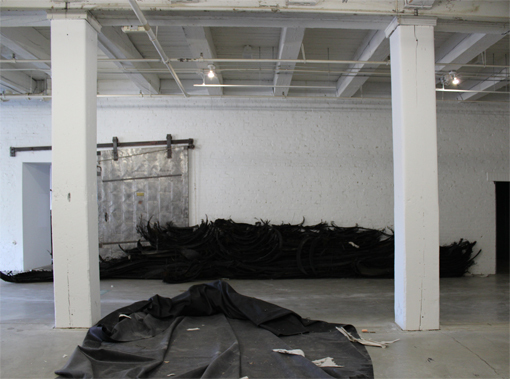 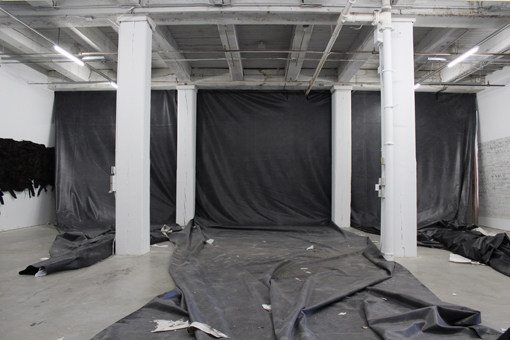 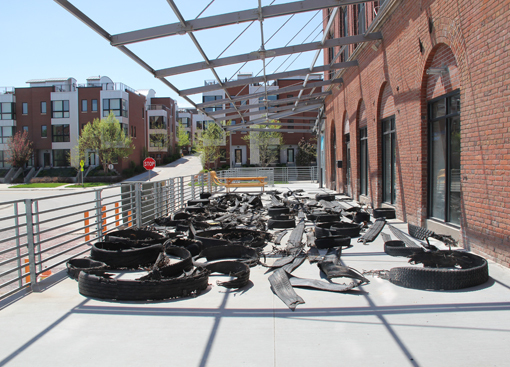 Beck’s exhibition expands from the galleries to the exterior loading dock and hallway and is a direct outgrowth of his work created while in residence. 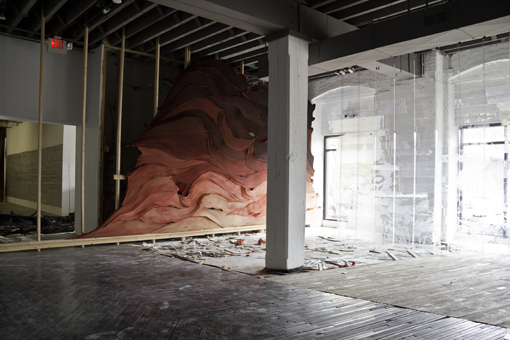 Beck creates singular spaces and environments that entwine evocatively repurposed mass accumulations of building materials with the architecture of the gallery to build crystalline emotional resonances. 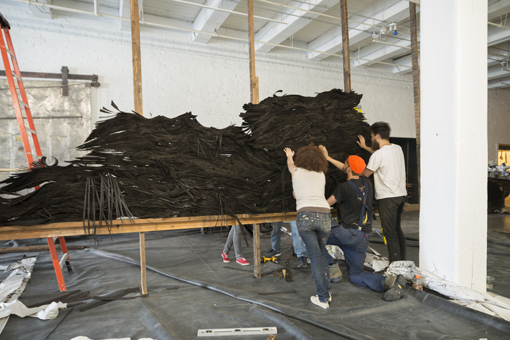 The installation process for this exhibition will continue throughout its duration — a progression that forms a critical aspect of the work. 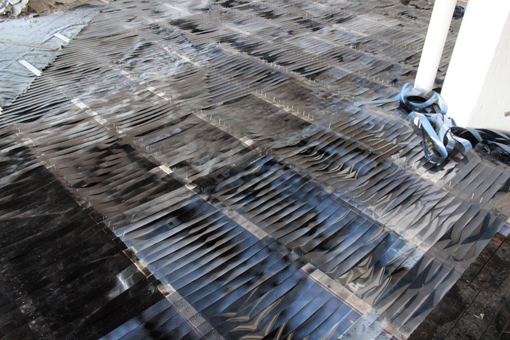 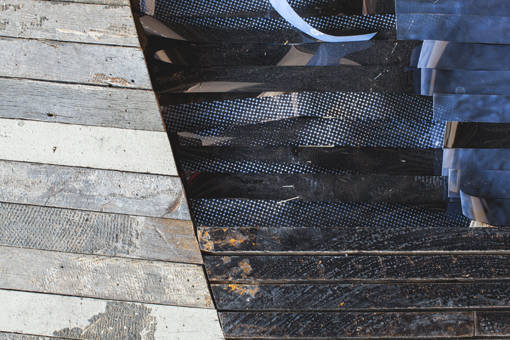 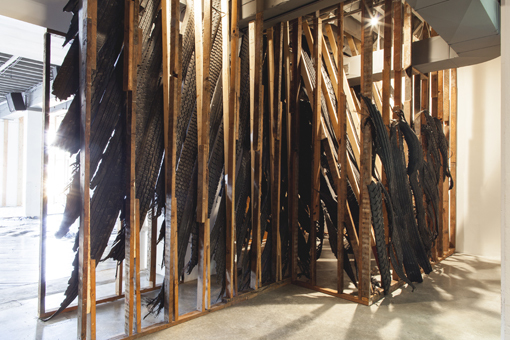 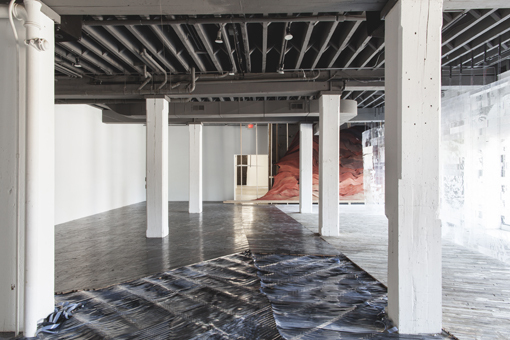 With materials including wood flooring, newsprint rolls, black rubber roofing, Hydrocal plaster, PVC pipe and rough framing lumber, Beck has generated an uncertain, shifting terrain that alludes to geologic and architectural forces, and reifies both the history of the building and its site. 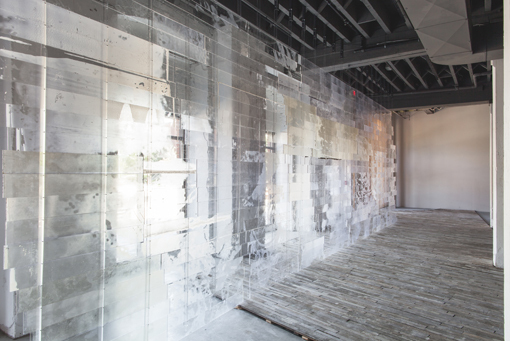 Beck’s process is a hybrid of his dual history working as an architect and a printmaker. 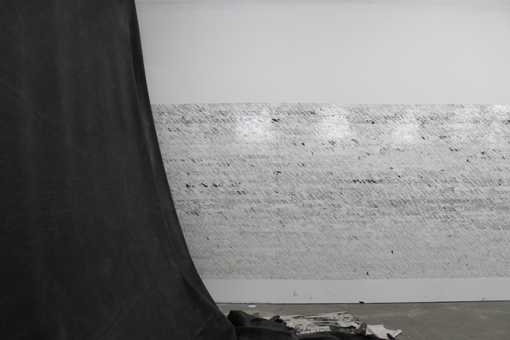 Here, the intentional line holds equal weight to generative and accidental marks. 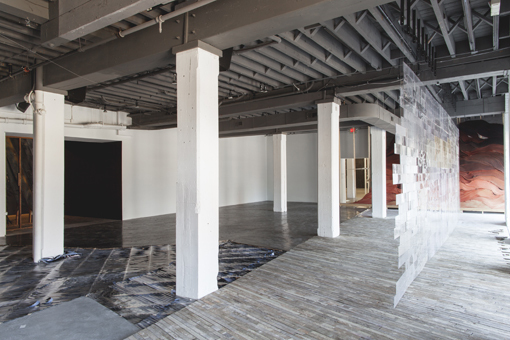 Beck has both expanded the act of printmaking to the scale of the building, and broken architecture down to its core parts. 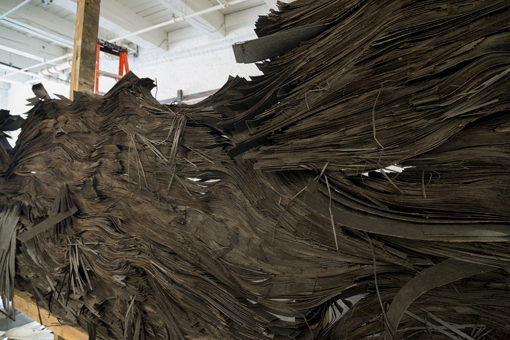 There is rich detail in the layers of his work — gashed paper rolls, seared wood, charred and flayed skins, chalky strata and warbling light casts. 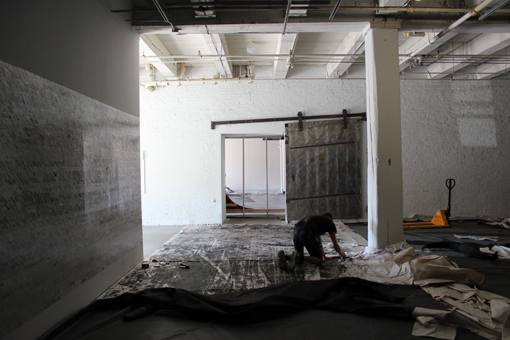 Viewers also have a hand in the work — as one moves through the exhibition, two kinds of printmaking will occur. 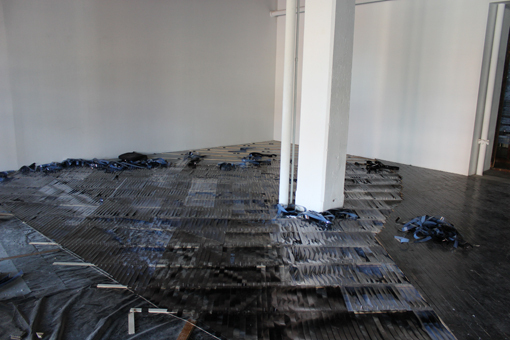 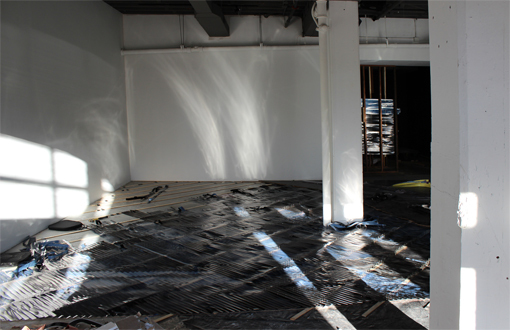 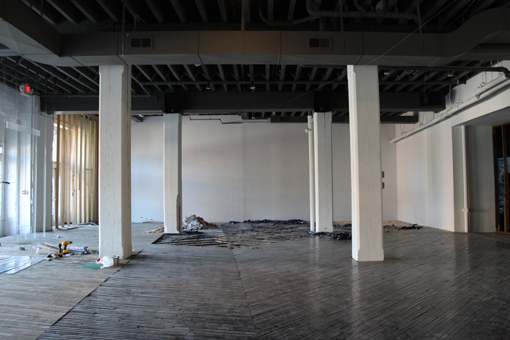 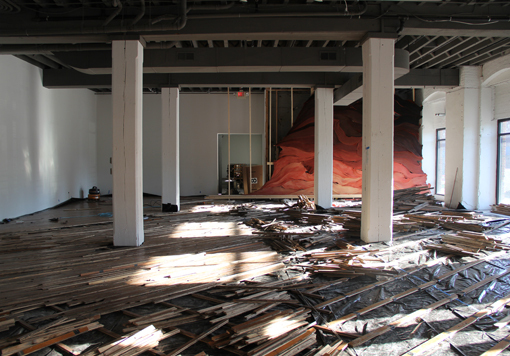 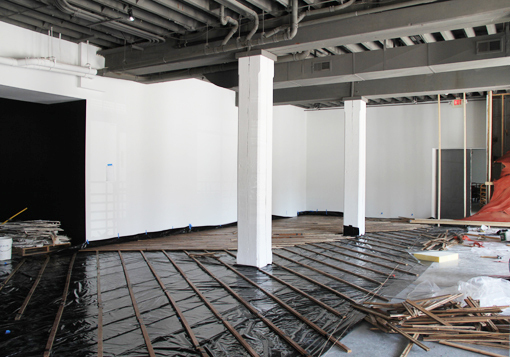 In Gallery 1, the stained floor will slowly reveal itself, as footprints mar its finish. 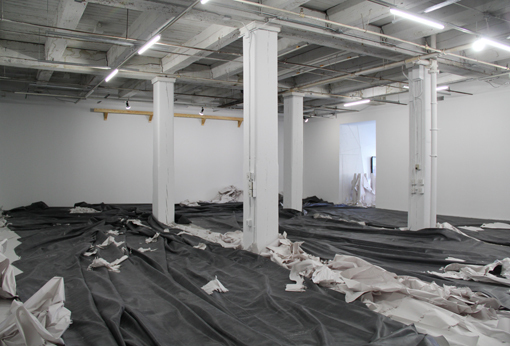 Gallery 2 will undergo an inverse process — the rubber membrane is inked on its underside, and the print resulting from gallery foot traffic will be later uncovered, a work literally produced by the weight and presence of visitors. 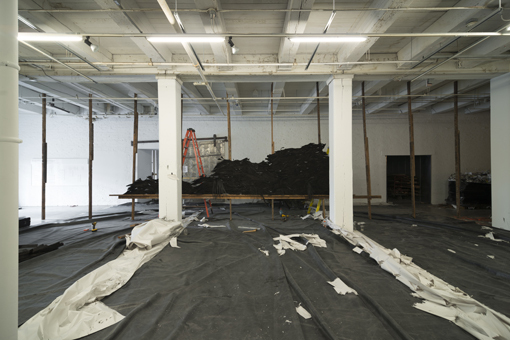 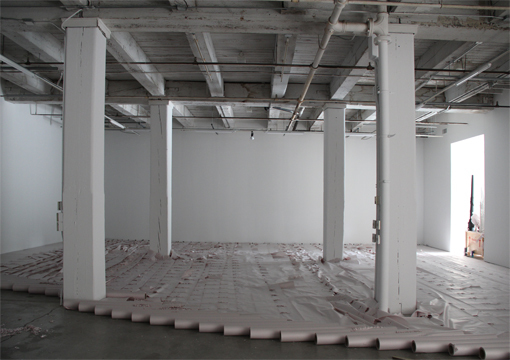 Much of the exhibition similarly sets the push of accumulation against the pull of excavation. 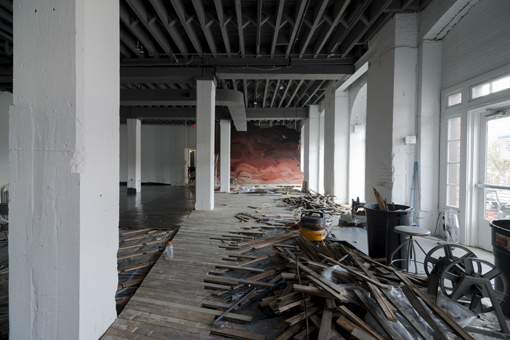 Strike Slip further highlights ongoing synergies between the Bemis Center’s international artist-in-residence and exhibitions programs. 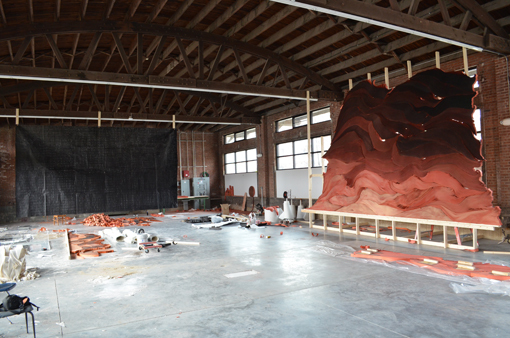 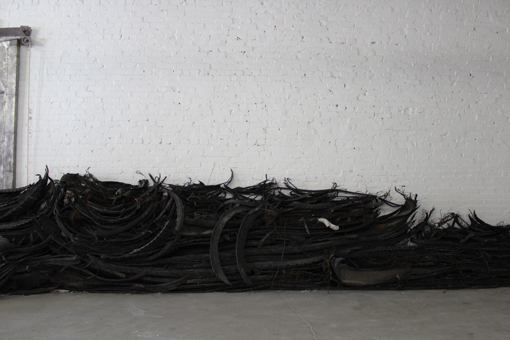 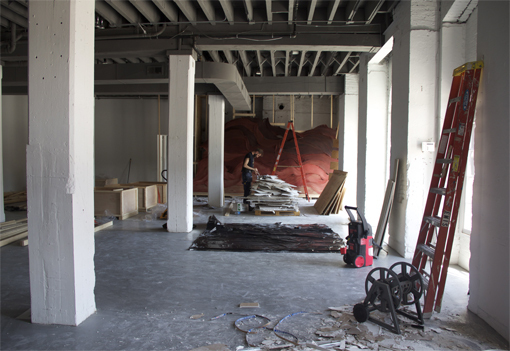 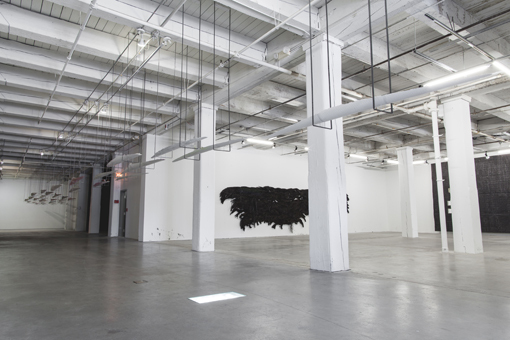 Beck was in residence during the spring of 2013, and during that time utilized the Okada Sculpture Facility as a testing ground for these new works. 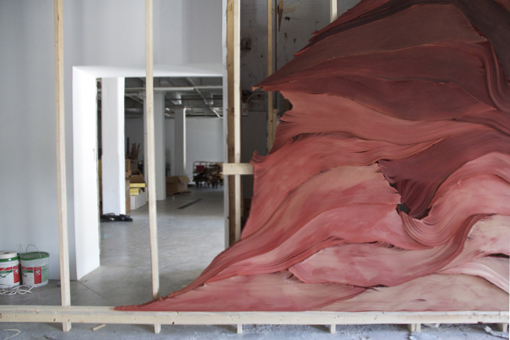 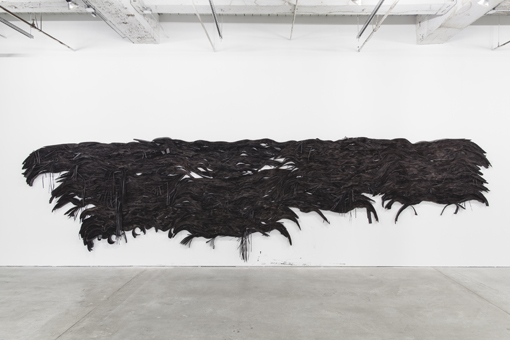 His exhibition is a continuation of that work — both in process and form. 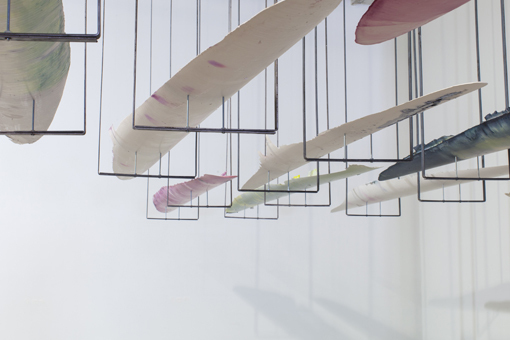 This exhibition, uniquely, will continue to morph in response to Beck’s repeated visits. 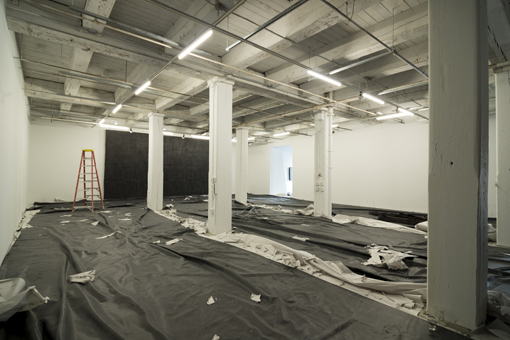 After the initial opening, Beck will return in early June and again in July and August, with new material, and reform the spaces to produce wholly new experiences of the exhibition. 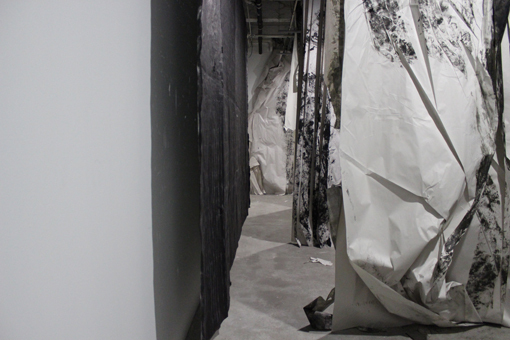 Strike Slip fully alters the gallery space and our experience of that space and reveals Beck’s process in real-time. 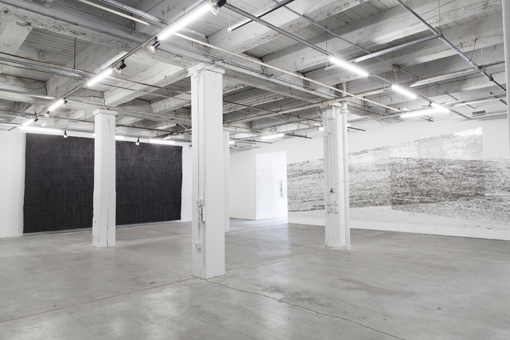 Only through repeated visits may one access the complex textures, sense-fields and emotional depth charge of the exhibition. 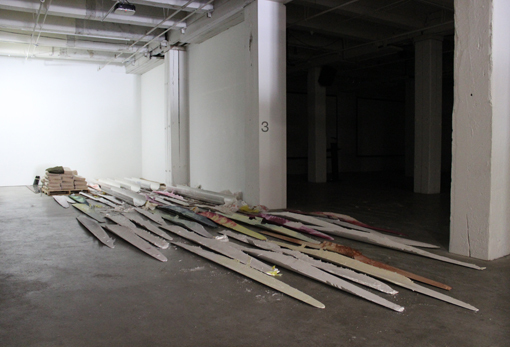 Strike Slip is organized by the Bemis Center for Contemporary Arts and curated by Hesse McGraw, Bemis Center chief curator. 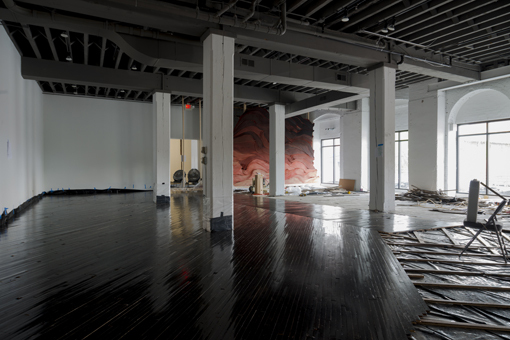 Jarrod Beck lives and works in Brooklyn, NY. 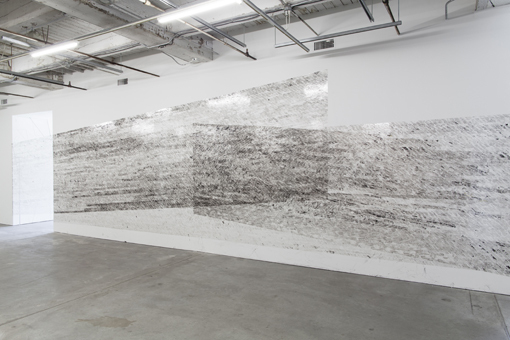 His drawings are in the collection of the Museum of Modern Art and he has created installations at the Socrates Sculpture Park, the South Street Seaport Museum, the Cape Cod National Seashore and the Provincetown Art Museum. 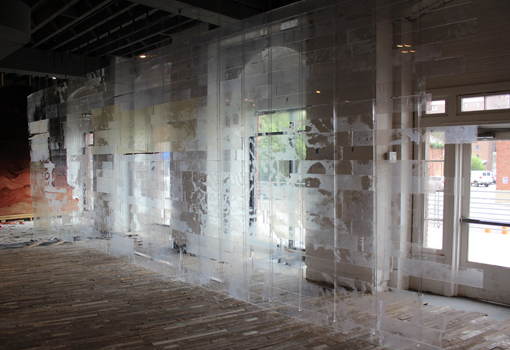 In June 2010, he began a permanent installation on five acres of land in the Chihuahuan Desert near Terlingua, Texas. 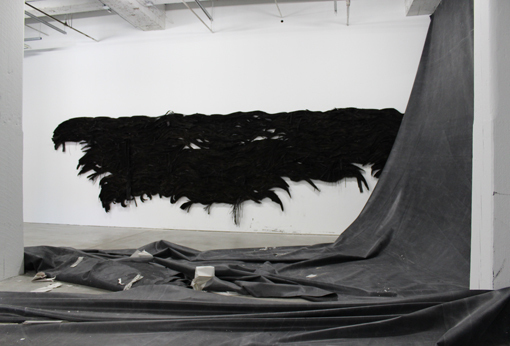 He has been a Visual Arts Fellow at the Fine Arts Work Center, Provincetown and MacDowell Colony. 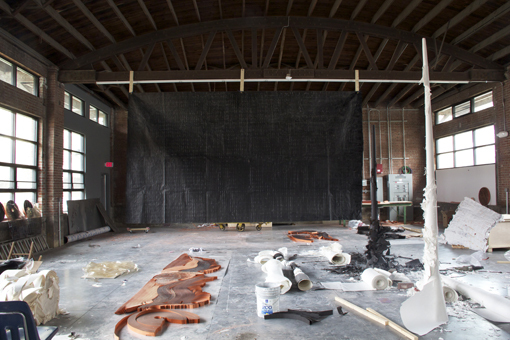 He is a Smack Mellon “Hot Picks” artist and received a Pollock-Krasner Foundation Grant for a residency at the Vermont Studio Center. 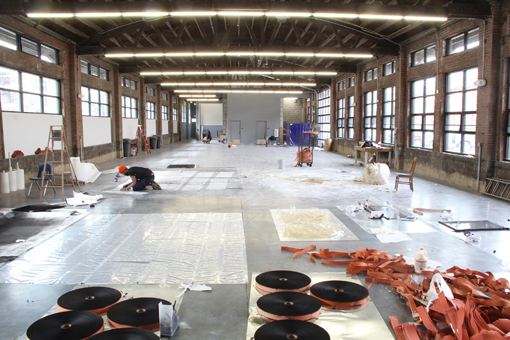 He will be in residence at The Robert Rauschenberg Foundation and the Siena Art Institute, Italy in 2013.